In its second year in DCU, the 2015 TEDx event saw a series of DCU alumni, faculty members and researchers take to the stage of The Theatre in The Helix to help spread the ideas they have or have had. The “x” suffix to the name indicates that this TED event is independently organised, allowing DCU to put its stamp on it by inviting people who have come through its hallowed halls, giving the university a stage to showcase its range of output and learning. The topic of this year’s series of talks was “Changing Lives, Challenging Perceptions”, a general enough range to let the speakers instil their ideas and thoughts into the 10-15 minutes of time they’re allowed on stage. Within the first two talks, you could already notice the range of ideas that would be brought to the fore on stage. Journalist Orlaith Carmody began with talking about her Family Forum, an idea that lets her family openly communicate, something she felt was lacking in society. The following talks of the first session including David Moloney, Chief Technical Officer of Movidius, explaining how machines are slowly but surely learning to see, Dr. Mary O’Connell giving a lightheartedly but informative talk on how the world today is in its sixth mass extinction event, and Niamh Bushnell, Dublin’s Commissioner of Startups, talking up the entrepreneurial spirit in the university and the city. The second session, after a lavish feed of tea and pastries, started with another stirring talk, this one from Louise Bruton, a journalism graduate of DCU. She asked the audience “how would you like to be treated?” as she discussed her experiences as a disabled person in an able body-favouring world. Prof. Niall Moyna, of DCU’s School of Health and Human Performance, told the audience of our stone age genes’ need to be exercised, and how space age technology will help that, calling exercise “the only prescription with unlimited refills”. The next two speakers, Kate Irving and Adam Harris, continued the health theme, talking about the four myths of dementia and autism in Irish society respectively. Irish Independent Legal Editor Dearbhail McDonald wrapped up the show describing the love of stories in Irish society and life in general. The range of topics talked about are indicative of the output of ideas that can come from DCU, and indeed any university, when someone with an idea are allowed go with it and work on it, whether scientific, medical, or social. 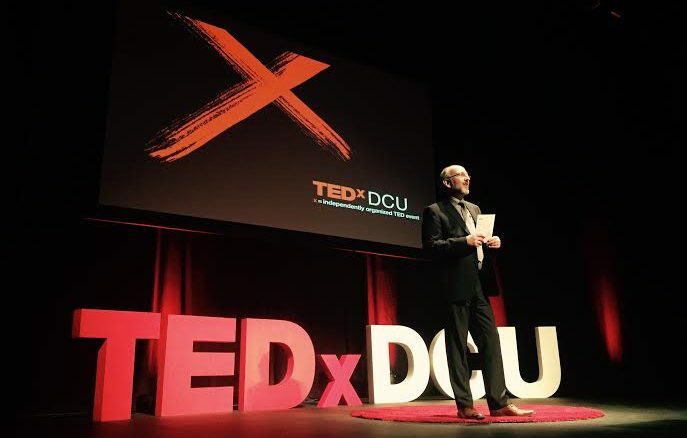 DCU President Brian MacCraith, when I asked about the university’s ability and drive to hold a TEDx event, said “DCU is a particular sort of university where we like to not only create knowledge but to share knowledge”, a fine way to sum up the event.